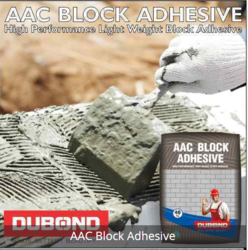 Pioneers in the industry, we offer aac block bonding adhesive from India. We have gained huge success in manufacturing and supplying reliable and high quality AAC Block Adhesive in Ahmedbad, Gujarat, India. We have developed a more efficient thixotropic, which is processed by using best quality raw materials such as, graded aggregates, high performing polymers and quality approved cement.